The inability of pro-Qaddafi forces on Monday to retake Misrata and Ras Lanuf appears to have impelled Muammar Qaddafi to begin back-channel talks with the provisional government in Benghazi about circumstances under which he might step down. Reuters said that he is seeking immunity from prosecution for himself and his family. The National Libyan Council is said to have rejected this demand initially, though Aljazeera Arabic quotes rebel leaders in Benghazi who are willing to offer Qaddafi immunity if he will step down. According to Aljazeera Arabic, fighting continued Tuesday morning in the outskirts of the hamlet of Ben Jawad. Rebel forces had briefly taken it this weekend, but had been forced to withdraw by heavy sniper fire. The partisans say that they are taking a break in their push west, during which they had advanced about 100 miles in two days this weekend, as they resupply from Benghazi and reconsider their strategy for reducing Ben Jawad. The rebels remain still firmly in control of the oil and refining town of Ras Lanuf, which they took Saturday, despite air raids and fighting on the fringes of the oil facility. The Arabic press says that Qaddafi was bombing Ras Lanuf again on Tuesday morning. 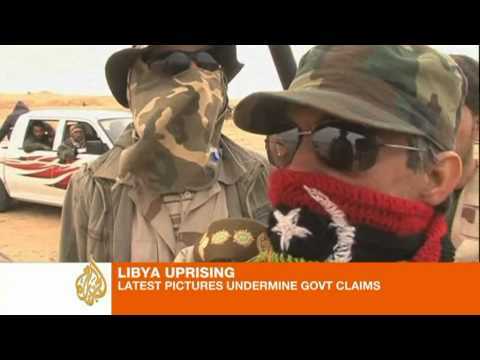 Despite air raids and armored attacks, Qaddafi’s forces were unable to prevail in the eastern large city of Misrata (Misurata), which fought off forces loyal to Tripoli, according to the Arabic press quoting eyewitnesses in the town. Aljazeera English gives the most extensive available account of events in the western city of Zawiya on Monday, where pro-Qaddafi troops deployed tanks and other heavy weaponry to take all the gates to the city and then to chase the rebels from the downtown area and from a central mosque. This is the fourth major attack on rebel-held Zawiya from Tripoli since Friday morning, with the previous three having been repelled by Zawiya residents. They were able to destroy a number of tanks with rocket-propelled grenades. Either the number of tanks committed on Monday was overwhelming, or the rebels are running out of rocket-propelled grenades. Zawiya’s rebellion faces special difficulties, since it is isolated to the west of the capital of Tripoli, and is the only major remaining rebel-held town in its area. Its residents therefore cannot expect much in the way of help from the Benghazi provisional government. Aljazeera Arabic says Tuesday morning that the city, while besieged, still has not fallen to government forces, and parts of it remain under rebel control. Although Qaddafi’s ability to riposte seems to be disheartening some observers, that his relatively well-equipped and better-trained troops and air force are so ineffectual against a rag-tag band of partisans must be inspiring profound fear in the Tripoli palace. The biggest number of casualties among volunteers in the rebel forces appears to derive from self-inflicted injuries owing to lack of experience with firearms. But even so, Qaddafi’s forces don’t seem able to go on the offensive effectively in the east. (Zawiya is not a success story for the Qaddafi goverment, because even if it falls in the end, it shouldn’t have been so hard to take).